wow great video, thank u.
Caroline had scandals but attracted many people to Monaco, and she was a great support for Rainier. Stephanie is a child-woman, never grew up and is just chaotic, but seems like a good mother. She also brought attention to Monaco. So the girls aren´t the problem. Alberts problem is he doesn´t have a sense of responsibility and is easily manipulable. That´s not a great leader material sadly. IMO he his still an angry child and hates criticism. If people criticize him he doesn´t reflect it, no he has this "Now more than ever" attitude. That´s why he married with 50 a woman which didn´t even learn the language. He doesn´t thinks of Monaco. It´s just me me me. As for Charlene: I think she should go study the language, the history of Monaco, the basis of economy, geography. Of course one could ask if she isn´t already learning: nope, her interviews just showed what she thinks is the duty of a Princess. It´s fashion and yes fashion. But if Albert isn´t interested in educating her, then I don´t thinks she isn´t interested at all, too. Like I said Albert is just focused on himself and not Monaco. I think marriage will help Albert grow as a person and be less self-centered. As a single man, it was okay to think about himself, but now he is married and the wife and kids need to come first. And this time he'll be around his children since they'll be from his wife and not just some woman he dated who was visiting from another country. Marriage is a good lesson in selflessness. And Charlene will accompany him on his duties, so they will focus more on Monaco. Maybe not right away as they're still newlyweds, but later on I hope they will. Charlene's birthday is coming up on January 25, maybe someone could send her a nice letter for her birthday and in it politely suggest that she learn French if she isn't already. I know I would like to learn French, and I live in California. I think Charlene is a bright new light around Pr.Albert, she doesn't have scandals and she seems quite nice. Charlene is studying the language and has been for awhile. It may take awhile until she feels comfortable attempting , getting a language takes longer for some. 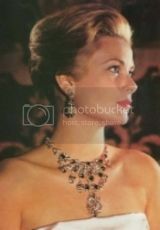 VILLEFRANCHE-SUR-MER, France — More than half a century ago, Grace Kelly began the arduous process of learning French after she married Prince Rainier and settled into life in the palace in Monaco at age 26. Today, the woman reportedly set to become the next Princess of Monaco, the South African swimmer Charlene Wittstock, 30, is taking the opposite tack. Wittstock is already ensconced in an apartment at the Palace in Monaco near Prince Albert, 50, and has been studying at the most exclusive — and intensive — French language school in the world, the Institut de Francais in Villefranche-sur-Mer — eight miles west of Monte Carlo on the French Riviera. Wittstock is the latest in a steady stream of diplomats, world financial powerbrokers, actresses (Kathy Bates, Kate Capshaw and Britain's Honor Blackman), athletes and royalty (Queen Sonja of Norway was a recent student) to attend the Institut hoping its unusual methods will help them perfect French. This has been reported several times and I believe it to be true. She seems like a disciplined person to me. Give her time. Honestly, I don't see how on earth she should have to be perfect just now; not knowing French is just fine since she didn't bet on anything serious happening with Albert, I'm sure. I wonder what theme Charlene will decide on next year for the Ball. She looked lovely and her hairstyle was positively scrumptious. The world’s attention has been focused on London this week as the Olympic Games unfold. But all eyes will turn to Monaco on Friday night for the principality’s most glittering event in the social calendar – the Monte-Carlo Red Cross Ball, which will be hosted by Prince Albert and his stunning wife Charlene. And there is added excitement for royal watchers, who will be eagerly anticipating the arrival of Andrea Casiraghi, who will be stepping out with fiancé Tatiana Santo Domingo for the first time since their engagement. I liked her dress of last year better! and she still looks too stretched&ironed in the face! They seem to be really enjoying themselves at all the outings. I think Charlene being involved in the Olympics with the SAfrican team coming to Monaco was very smart. She seems to be finding her way more and more. Good for her. Love the earrings, she looks glamorous, pretty. 2017 marked the 69th year for the Red Cross Ball.